Italian, cooking, wine, and cheese all seem to flow together in perfect harmony. Tonight was another FAST meal prepared in less than 30 minutes with an outstanding finish of a 5 out of 5. The trick here is not to rush the sauce! 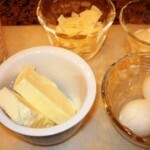 Melt Butter, and add Garlic, saute on low eat. Gently simmer for 5 minutes. Add your Gnocchi to your boiling salted, oiled water. Saute the sauce for another 5 or 10 minutes while the pasta cooks. All the cheese should be melted and there should be a nice saucey sauce now. Drain your pasta when the Gnocchi floats to the top. Plate the pasta and drizzle the wonderful Tres Formaggio over the pasta. Serve with a delightful Caprese Salad. The Balsamic Vinegar cream on this salad is amazing! 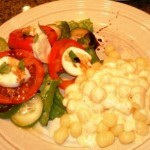 This entry was posted in Cooking, Uncategorized and tagged caprese, cheese, Gnocchi, pasta. Bookmark the permalink.